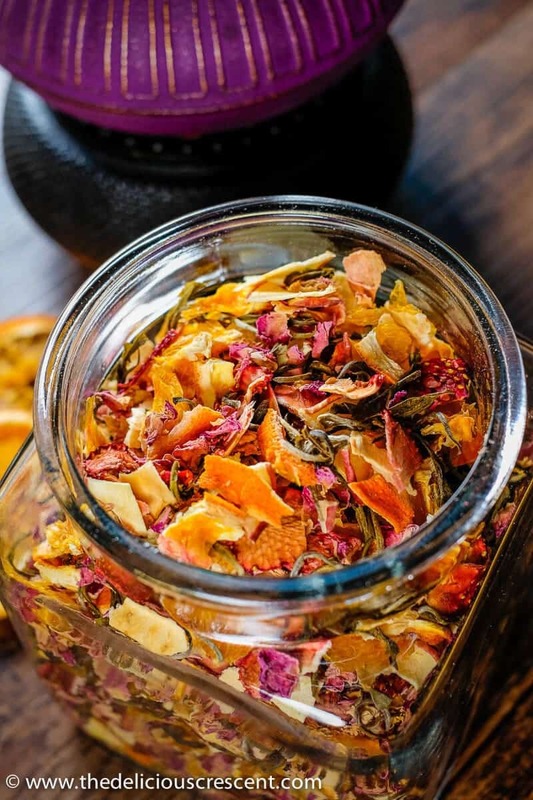 Homemade tea blend with citrus, berries, apples, roses and white tea is an invigorating infusion of sweet fruity flavors and the lively taste of antioxidant rich white tea. The idea of this tea actually comes from my husband, who is an ardent aficionado of all kinds of tea. 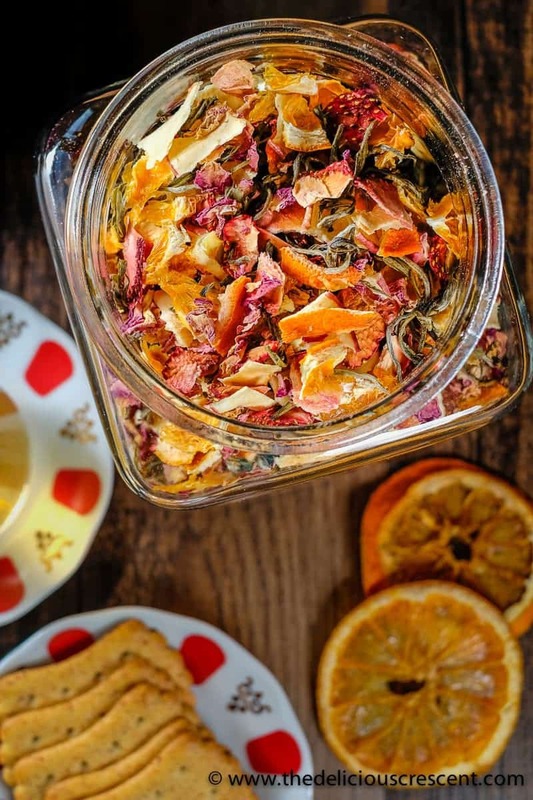 A while back he had made a great concoction using fruits dried in our food dehydrator and combined with some white tea, dried herbs and flowers. It was so soothing and refreshing. So, I wanted to recreate that. And if you have been following this blog, you may remember another easy treat made with chocolate and dried fruit (oranges). There are many varieties of commercially available teas of this kind. 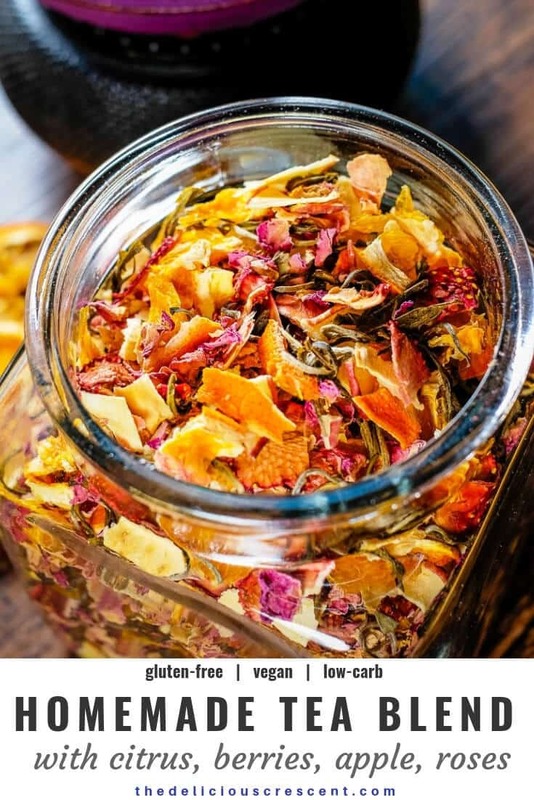 But if you have a food dehydrator at home, you can easily make your own copycat teavana tea creations – all for a fraction of the cost and it is so much fun. 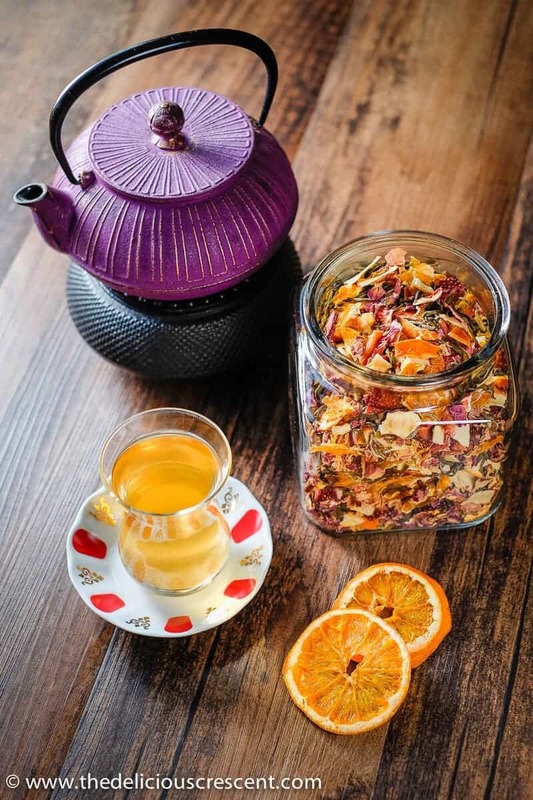 The best thing about this is that you will not need to use added sugar, as the dried fruits will release their sweetness during the tea infusion. Besides, that perception of sweetness is further heightened due to the sweet fruit flavors. Have you tried white tea? It is much lighter in taste and color than black or green tea. Rather it results in a beverage that is pale yellow in color. White teas are typically made from young or minimally processed leaves of the plant. It comes mostly from China and some parts of northern India. So, during my trips to India, I make sure to bring back some of it! White tea is rich in polyphenols with antioxidant properties. In fact, some research suggests that it may have more antioxidant potential than even green tea! It has been lauded for its anti-aging benefits and role in disease prevention. Some studies have shown that it may be beneficial in lowering blood pressure as well. Drinking white tea regularly has also been associated with greater bone density, healthier teeth and skin. And the good thing is that white tea will not stain the teeth like the darker teas! It is important to choose fruits that are in the peak of the season. This will optimize the flavor and sweetness you can derive from the fruits. So pick fresh, ripe and sweet fruits. Make sure to not let the fruits over-dehydrate. Otherwise they may turn dark and have more of a caramelized flavor, rather than a fresh fruity flavor. If you do not have a dehydrator, here is a resource for drying fruits in the oven (but I have not tried it myself). Try to choose fruit, floral and herb flavors that will blend well together. When using white tea, you can use more of it in the blend as it is much milder and it can also be be steeped longer. But you could also try green tea. Scrub the surface of the oranges and apples with a vegetable brush and rinse well. Rinse the strawberries very well and drain. Wipe the fruit surface dry using a paper towel. Slice the fruits crosswise using a mandolin slicer or a sharp knife. Retain the peel and cut fruit into uniform 1/4-inch thick slices. Discard the end slices. Then place the fruit slices on the food dehydrator trays. Stack the trays in the dehydrator and turn it on. Next, let the fruit slices dehydrate until the fruit center is dry. Depending on the number of trays stacked, this may take six to eight hours or more. To allow uniform drying of the slices, do remember to switch the order of the trays. Once the fruit slices are dried well and crisp, break them into smaller pieces. 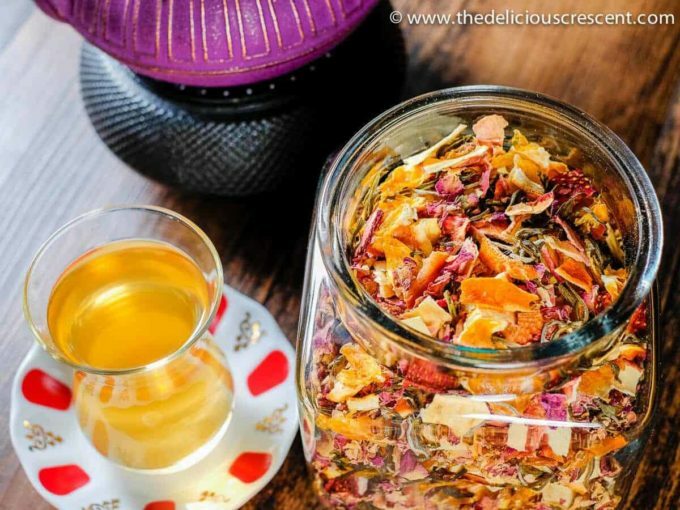 Using the suggested ratio, combine the dried fruits with the white tea and dried roses. You may add some dried herbs if you prefer. Use hot water (but not boiling) as the tea may turn bitter due to the longer steeping time. You may use two tbsp of the homemade tea blend per 1 cup hot water. Adjust as per your taste. White tea can be steeped longer than black tea. It is recommended to steep the tea for 7 to 10 minutes. 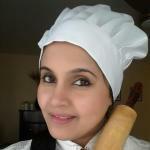 Do check out my homemade tea preparation tips above. Here is a detailed tutorial for white tea preparation. The calories are an approximation based on similar commercial tea preparations, as it is difficult to estimate the amount of calories from the fruit sugars released. Nevertheless, they are minimal. Very nice! However, I prefer to just buy my tea combination from Teavana. Makes me think that the opportunity cost making the tea myself is not worth it unless I am making a large quantity. as a gift perhaps. ? Thanks Jane. I only need to cut the fruit, which doesn’t take much time and I make a lot at a time. Easier than most home cooked stuff for someone who enjoys home cooking. Twelve dollar for couple tiny ounces is not for me. I want to have plenty ?. I’ve never made my own tea blend. But I love tea and fruit tea is my occasional treat! I love the homemade version. Definitely will put my dehydrator to work and will make this asap! Thanks for fab recipe!! Thanks Shinee. Enjoy! Let me know how it goes. I’ve never made my own tea mix before, but this looks so easy! I love the flavors you chose. Such a lovely combination! Will have to find some of those ingredients and try it out. Bet it tastes delicious. Thanks Oriana. It’s easy. I just dehydrate the fruits at home. And white tea is available at Chinese stores for a less expensive price. This looks absolutely amazing. I love the idea of homemade tea. Not only is it gorgeous but I bet it’s super aromatic. This would make such great gifts too. Love it. Thanks Kim. Yes it does make a nice gift.